There is a certain sense of serenity aboard the giant trimaran: with each radio session hosted by one of the ten men on Groupama 3, it's another point of view which testifies to the excellent atmosphere that reigns over this third attempt... This time, it's Jacques Caraës, bowman and cameraman, who shares his delight at being at sea, flying along at an average of nearly thirty knots in the tradewinds, to the South of the Cape Verde archipelago. "We still have good pressure and the breeze has veered round to the East a little: this Friday lunchtime we're under full mainsail and solent jib, but we're still making very good headway at an average of thirty knots. We're now picking our way due South and things are calmer with the genoa: we're just using the pilot to helm but the trimmers are on the sheets as there's a big gust from time to time. The seas are very ordered and the skies are a little overcast..." indicated Jacques Caraës at the lunchtime radio session with Groupama's Race HQ in Paris. "We did well to take this window, even though the Southern Atlantic doesn't look to be very organised to date. It's a sport where nature guides the days, despite the high-tech equipment and the men: the weather parameter is essential and the boat is absolutely magical... You really couldn't tire of it! For this attempt, the crew has already sailed a lot of miles together on this trimaran: there's a superb cohesion and an extraordinary atmosphere. 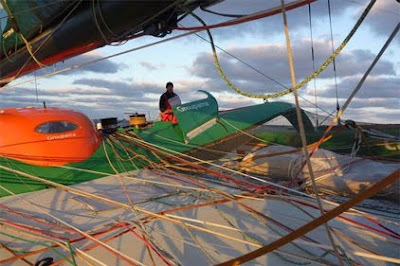 This attempt is likely to be the one and if nature is opening its doors to us it's because we now know Groupama 3 like the back of our hand..."
Jacques Caraës couldn't recall the number of times he's traversed the Doldrums (at least a dozen times!) and recognised that he'd never had the same weather conditions twice! "It's always different... I've experienced some violent, peaceful, long and short trips, but with Groupama 3, we've passed through very quickly each time. During the delivery from Cape Town in Lorient this winter, we didn't even get a glimpse of it! This time it's shaping up to be very good again because we're positioned quite far West..."
It remains that the weather situation isn't yet very stable off the Brazilian coast however. Dropping due South is one thing, but hanging a left to get to the Cape of Good Hope as quickly as possible is another! For the time being the high pressure is barring the shortest route so Groupama 3 may well have to take a big detour if the situation doesn't evolve quickly.